4.16.2019: Wee wee wee! WOLF is here! I had a lot of fun writing this story about five excitable little pigs and their ambitious party plans (and Wolf, who might ruin everything). And I had even more fun seeing the humor and depth (and the game of seek-and-find) Charles Santoso’s fabulous illustrations bring to the tale. To purchase a copy of Watch Out for Wolf! please follow one of these links, or request it at your local bookstore or library. Thank you! I look forward to signing books and meeting readers at festivals and library events in Kentucky, Louisiana, New Jersey, and Maine over the next few months. If you live in or near a town I’m visiting, I’d love to see you there. For more information, please visit my events page. I wrote a piece for the February 2019 issue of The Writer magazine (on newsstands now) called Strive to Fail (published online as Six Counterintuitive Goals to Shake Up Your Writing Routine), in which I suggest some attainable—and perhaps surprising—objectives to set, such as Aim Lower, Seek Rejection, Slack Off, and Read Terrible Books, to aid in the pursuit of your writerly ambitions. Last week I had the pleasure of speaking with author Mindy McGinnis for her podcast, Writer, Writer, Pants on Fire. We discussed redirecting anxiety into creativity; writing across age categories; the nuts, bolts, and vulnerabilities of publishing personal essays; and more. You can stream or download the episode here, or find it on your favorite podcast app. Happy trails to you, too! Always Forever Maybe has been out in the world for six months today, and to celebrate, I’m hoping to donate some copies to underfunded school and public libraries. Will you please help spread the word? If that’s your school or library, please request the book at https://tinyurl.com/AFMdonation (that link brings you to a google form). If you know of an underfunded school or library in need of YA books, please share this post with them. You can also find a shareable version of it on my Twitter, Facebook, and Instagram pages. Thanks for your help! I’m so grateful to all of you who have read, shared, borrowed, bought, or talked about the book this year. Your support means the world. P.S. The Anna, Banana chapter-book giveaway has closed, and I’m in the process of sending more than 100 new books to Title I public schools in eighteen different states. P.P.S. If you’re in NYC, come see me tonight at my last public event of the year: Teen Author Reading Night at the Jefferson Market branch of the New York Public Library. I’ll be sharing the stage with some incredible writers, and reading from and talking about Always Forever Maybe. More details here. New Album and New Music Video! One of the most fun things in my life is making music with other people, and for the past three years I’ve been fiddling my heart out in the band Owen Lake and the Tragic Loves. We have a new album out today, The Best of Your Lies, released by Carrier Records. I hope you’ll take a listen. Owen Lake and the Tragic Loves’ “electro-country” sound is both freshly nostalgic and startlingly unique. Hard-driving synthesizer licks meet tight three-part vocal harmonies, buttery bloops and bleeps, crying pedal steel, and pounding electronic beats in the band’s genre-bending style, which draws from the traditions of 1960s country, 1980s dream pop, and modern electronic dance music, mixed with an experimental aesthetic all the band’s own. It packs an emotional punch to the heart, and beckons the bruised listener onto the dance floor. You can stream the new album on Bandcamp or Spotify, or download it on iTunes or Bandcamp. It’s also available on cd and vinyl. The Best of Your Lies includes fun new versions of songs made famous by Dolly Parton, Johnny Cash, Johnny Paycheck, George Jones, and more, but I’m especially proud of the two original songs for which I wrote the lyrics: ”Wicked Heart” and the title track. Earlier this week, Everything Is Noise premiered the music video for “The Best of Your Lies,” directed by visual artist Jessica Segall and featuring not only Owen Lake and the Tragic Loves but also (in a quick cameo during my fiddle solo) my dog, Arugula. Owen Lake says the video “fulfills my dream of being in a 1960s country music television show, as transmitted from outer space.” Here’s the link to watch and listen. For news of upcoming Owen Lake and the Tragic Loves shows, videos, and more, please follow us on Twitter and Instagram at @owenlake_, and like our page on Facebook. Thanks! This fall, I'm hoping to donate the two newest books in the Anna, Banana chapter-book series (Anna, Banana, and the Recipe for Disaster and Anna, Banana, and the Sleepover Secret) to high-poverty public elementary schools* (meaning either Title I or schools where more than 70% of the students qualify for free or reduced-price meals). If that's your school, please be in touch! You can request the books by filling in this form. If you know of a school in need, please share this post or link and encourage a teacher, librarian, or administrator there to make the request. You can also find shareable posts about the giveaway on my Facebook, Instagram, and Twitter accounts. Thanks for helping spread the word! *U.S. schools only, due to shipping costs. Giveaway ends November 30, 2018. The Anna, Banana chapter books are best for students in grades 1-4. For more information about the series, please click here. 10.9.2018: Can you keep a secret? The seventh book in the Anna, Banana chapter-book series is out today in paperback and ebook, with the hardcover to follow soon (November 6). What’s it about? A sleepover! Secrets! Truth or Dare! Older sisters! Supersparkly nail polish! Silly surprises! A cat named Mewsic! And Anna, her two best friends, and her dog, Banana, of course. If you’d like to read the book and find out what the big secret at the sleepover is, please ask for Anna, Banana, and the Sleepover Secret at your local bookstore or library, or follow one of these order links: Indiebound | B&N | Amazon | BAM | iBooks | Target | Indigo | Book Depository (international) | S&S. Thanks for your support! Shhh…. Watch out for Wolf! This little piggy is excited to share the cover for Charles Santoso’s and my 2019 picture book, Watch Out for Wolf!. It’s the story of five anxious but enterprising little pigs who are preparing a very big surprise. It recasts the “This Little Piggy Went to Market” nursery rhyme, weaving in other beloved fables and tales (including the story of The Three Little Pigs) along the way. It’s also a story about friendship, assumptions, and inclusion. I had a lot of fun writing it! And even more fun seeing Charles’s delightful illustrations bring it to life. Charles and I did a fun interview with Mr. Schu about the process of creating the book. If you’d like to read it, please click here. That post also includes a peek at some of the interior spreads. Meanwhile, Always Forever Maybe has been out in the world for three months, and in some ways it still doesn’t feel real. If you are one of the people who has bought, borrowed, read, reviewed, discussed, or recommended it, THANK YOU. My favorite part of this YA author life has been interacting with readers (that’s my favorite part of chapter-book and picture-book author life, too). I got to do some amazing bookstore and library events up and down the east coast over the summer, and I’m looking forward to upcoming book festivals and other events in Princeton, Warwick, Chicago, Brooklyn, Miami, and Manhattan this fall. (Three of those events—the Princeton and Warwick Children’s Book Festivals and the Brooklyn Botanic Garden Ghouls & Gourds Festival—will include the Anna, Banana books and The Teacher’s Pet in addition to Always Forever Maybe, if you know a younger reader who would like to meet an author and get a signed book.) If I will be in your city or town, I would love to connect. For more details, please visit my events page. It’s going to be a fun and busy fall! Now there are six! ...and here comes the seventh. Anna, Banana, and the Recipe for Disaster (book six in the Anna, Banana chapter-book series) came out last week in hardcover, paperback, and ebook. The book is full of sweet treats (and snickerdoodle secrets, friendship messes, and kitchen disasters), so I took it out for ice cream to celebrate. When I started writing the first story about Anna, her dog, and her two best friends, I never dreamed there would someday be six of them (let alone with the seventh and eighth soon to follow—more on that below). I am grateful to each and every one of you who has helped make this happen and/or cheered me on along the way. Thank you. What's it about? A sleepover! Secrets! Older sisters! Surprises! Truth or Dare! Supersparkly nail polish! And Isabel's enormous tabby cat, Mewsic. To learn more about the plot and read a brief excerpt, click here. I'm over the moon to share this news about my third(!) picture book. Love, Sophia on the Moon is an epistolary story near and dear to my heart, and I'm thrilled to be creating it with the talented Mika Song (if you're not already familiar with Mika's amazing illustrations, please check out the cuteness on her website), super editrix Rotem Moscovich, and the whole wonderful team at Disney-Hyperion. There's lots of mischief and make-believe in this one, and some tugging at heart strings too. I hope you'll like it. Anna, Banana, and the Recipe for Disaster (#6) comes out March 20 (next week!) in hardcover, paperback, and ebook. It contains baking disasters, friendship messes, snickerdoodle secrets, and, of course, a cute dog. 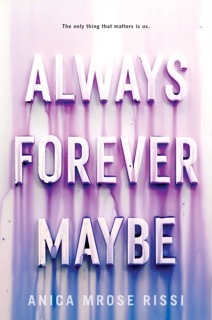 Always Forever Maybe, my YA debut, releases on June 5 in hardcover, ebook, and audio. I am really excited for you to read this one. I spent six years working on it, and it makes me nervous and giddy just thinking about it being real. It's about obsessive love, toxic masculinity, enduring friendship, and the risks we take with our hearts. 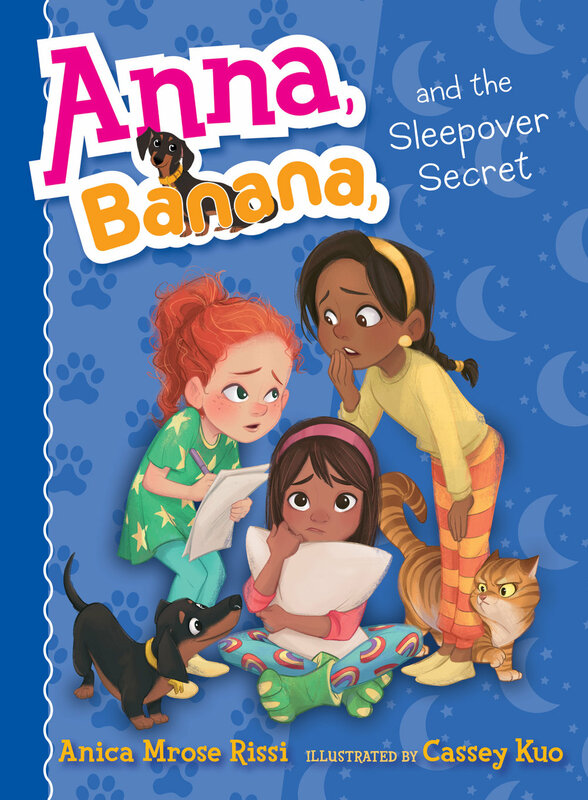 Anna, Banana, and the Sleepover Secret (#7) comes out October 2 in hardcover, paperback, and ebook. Cover reveal coming soon! This one includes a sleepover and many secrets (of course), not to mention Truth or Dare surprises and an enormous cat named Mewsic. Click on any of the above titles for further information, including pre-order links. Thanks for your interest and support! I wrote a piece for the January 2018 issue of The Writer magazine (out now!) about how to revise a picture-book manuscript. In it, I share my best tips, tricks, questions, and approaches to keep in mind as you play and experiment with your draft. To read a PDF of the article, click here. In the meantime, I'm finishing up revisions on Anna, Banana, and the Sleepover Secret (book seven in the series, coming in October), drafting what I hope will be my next YA novel, and trying to contain my nerves and excitement as advance reader copies of Always Forever Maybe make their way into the hands of booksellers and reviewers. Some fun news: In addition to the hardcover and ebook editions coming in June, HarperCollins will also publish Always Forever Maybe as an audiobook! (Available for pre-order now, wherever you like to purchase books.) Huge thanks to the B&N Teen blog for including Always Forever Maybe on their list 21 of Our Most Anticipated Debuts of 2018. They said: "This is a story about first love, sweet until it turns bitter....Rissi has a deft touch on a heavy topic, addressing abuse while still managing to infuse this meaty debut with romance, real #BFF goals, and dashes of humor." And here are some photos of my dog with her new teddy bear. 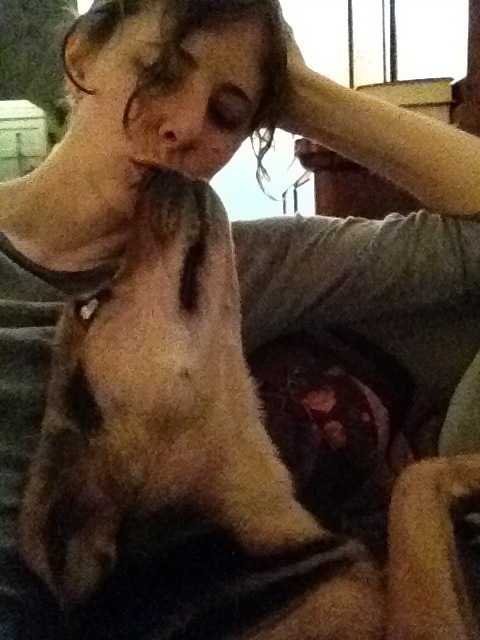 Welcome to the blog of Anica Mrose Rissi, fan of dogs and ice cream, author of Anna, Banana, and the Friendship Split (S&S) and other books in the Anna, Banana series, the picture books The Teacher's Pet and Watch Out for Wolf! (Disney-Hyperion), the YA novel Always Forever Maybe (HarperTeen), and more. Thanks for visiting! I look forward to hearing from you. Find me on Twitter, Facebook, Instagram, Tumblr, and Goodreads. Find the Anna, Banana books on Indiebound, B&N, BAM, Amazon, iTunes, Target, Indigo, Book Depository (international), Goodreads, and Simon & Schuster. Now booking SCHOOL VISITS for fall 2018 and 2019. For more information, please see the school & Skype visits page.